*SOLD* Congratulations to Dawna in Washington on her purchase of this fantastic boy! 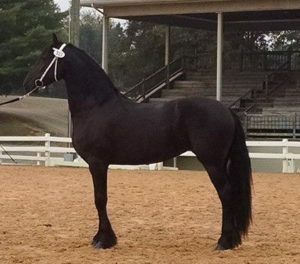 Bijou- 2 year old purebred Friesian gelding (Jesse 435 x Bonne). He is registered with KFPS and transfer of registration will be included in his price. This handsome guy is looking for a forever home. He is tall, elegant, and a fantastic mover. Bijou will make a wonderful dressage prospect. Please contact us for more information. Payments are acceptable. This foal is going to be amazing. 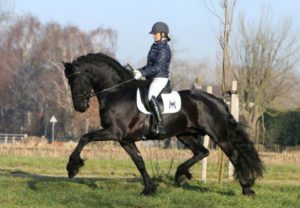 Jette is a lovely, sport-type Ster Friesian mare with gorgeous movement and hair for days! She is confirmed in foal to the stunning Friesian stallion Hessel 480. We are currently accepting in-utero offers for this foal. Price at birth will depend on gender. Contact us for more information on how you can purchase this foal.